Oops - we don't appear to have a video for the DR-7550C. 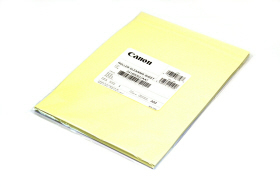 The Canon DR-7550C captures a super-quick 75 ppm while scanning in colour, and black and white, at resolutions of 300dpi (A4, Portrait). A dedicated onboard image-processing chip achieves full rated speeds even when multiple image processing functions are selected. The frontfeed design of the Canon DR-7550C provides both comfort and convenience allowing you to load, feed and remove documents effortlessly whilst seated. Furthermore, the control panel and job buttons are all designed to be easily viewable at eye-level. Invoices, delivery notes, reports, charts - some of the many documents businesses process every day. The Canon DR-7550C comfortably handles them all, increasing efficiency and reducing paper workload costs. 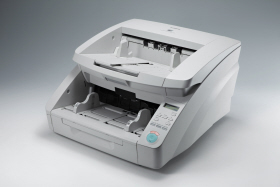 The Canon DR-7550C boasts strong environmental credentials too and is one of the most energy efficient scanners in its class. The Canon DR-7550C is designed to take on your toughest workloads and reliably handles suggested daily duty cycle of up to 15,000 scans a day. Canon's CapturePerfect software is bundled with the Canon DR-7550C Document Scanner, with a Capture Perfect Software Developers Kit (SDK) also available for easy, customised integrations.